On June 26, 2018, GE announced a number of major strategic initiatives, and we expect another dividend cut in 12-18 months as a result. Read our note regarding GE's announcement and its impact on the company's dividend. Equipment typically generates a little over half of GE's total industrial revenue. Product services, which are usually under multi-year contracts with customers and include spare parts, equipment upgrades, equipment monitoring, maintenance, and repair, account for the remainder of the company's industrial business. Importantly, service activities enjoy very high margins and account for the majority of GE's profits. Note that GE also has a financial arm, GE Capital, which has $157 billion in assets and is used to help finance customer purchases. GE Capital generates about 5% of revenue but is undergoing financial and accounting issues that are creating losses and regulatory headaches for the company. GE used to be considered the ultimate American success story and, up until recent years, was one of the world's most venerable corporations. GE was also famous for its elite R&D and managerial excellence. For example, the company's Crotonville managerial institute was renowned as the training ground for some of the world's best corporate executives. That includes several that went on to become the CEOs of Home Depot (HD), Boeing (BA), and 3M (MMM). In the 1980s new CEO Jack Welch (who Fortune named "CEO of the Century" in the late 1990s) built up GE into a vast sprawling empire, including through the company's acquisition of NBC. More importantly, GE Capital, which had been founded to finance industrial customer purchases during the Great Depression, acquired various consumer-facing businesses such as credit cards, home mortgages, and various insurance products. Welch stepped down as CEO in 2001, and his replacement, Jeffrey Immelt, proceeded to make further splashy acquisitions, including Vivendi's entertainment division Universal for $5.5 billion and the British medical imaging company Amersham for $9.5 billion. Immelt's stated goal was to return GE to its industrial roots, but GE Capital continued to grow during the financial speculative period of the early and late 2000's. This was because it continued to acquire credit card companies, subprime lenders, and commercial real estate. In fact, between 2001 and 2007 GE Capital had quadrupled its profits, which made up about 50% of GE's total net income. Then the financial bubble burst, and GE Capital's exposure to toxic assets (especially subprime mortgages and various related derivatives) nearly bankrupted the company in 2008 and 2009. This also forced GE, who had been a dividend aristocrat (25+ years of consecutive dividend growth), to cut its payout by 68%. The company was saved by a $15 billion emergency capital raise (including $3 billion from Warren Buffett's Berkshire Hathaway) and $139 billion in loan guarantees from the Federal government. In the aftermath of the financial crisis, Immelt vowed to sell off most of GE Capital that wasn't directly tied to its industrial businesses. 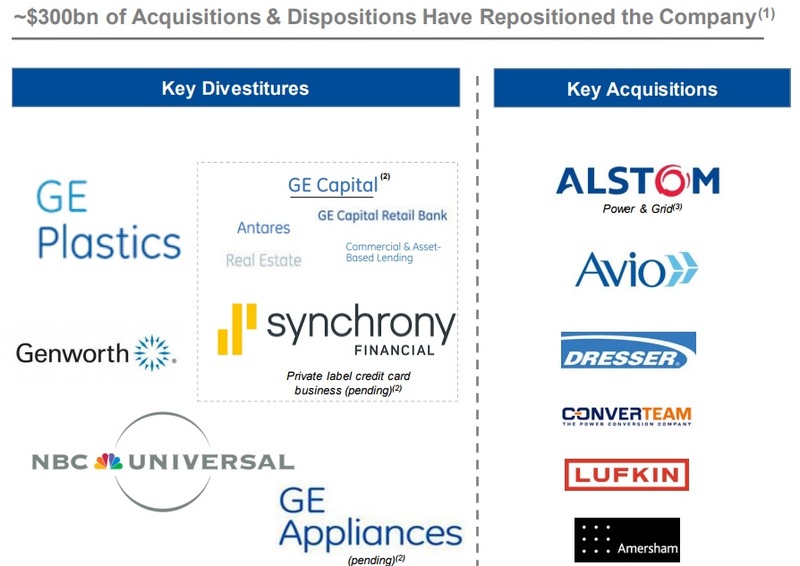 GE also divested various other businesses it considered non-core to its new industrial focus. The money raised from asset sales was used to return cash to shareholders ($49 billion in buybacks between 2015 and 2017) and double down on industrial investments. This included paying $10 billion for French coal and gas power generation maker Alstrom in 2015, as well as oil & gas services giant Baker Hughes in 2016 for $32 billion. In addition, Immelt invested heavily in Predix, GE's digital industrial software platform. The hope was that GE would become the world's largest industrial internet of things (IoT) provider, connecting all of its various product offerings to the internet to allow customers to obtain valuable real time data. This would be used to improve maintenance, repairs, as well as the productivity of its products and thus make them more competitive. However, by late 2017 it had become clear that GE's nearly decade-long turnaround had failed. The company had mistimed (and vastly overpaid) for many of its acquisitions, whose sales and profitability were not living up to expectations (including synergistic cost savings). The power generation and energy markets, some of GE's most important areas of exposure, had fallen on hard times as well. In addition, Immelt's decision to continually sell off assets and return most of the cash via buybacks had resulted in revenue, earnings, and cash flow declining by substantial amounts. In mid-2017 Immelt announced he would be retiring, and in October 2017 John Flannery, a 30-year veteran and the brains behind GE Medical's impressive turnaround since 2014, took over the CEO position. A 50% cut to the dividend. Refocus on core segments, specifically those where GE has dominant market share: power, aviation, and healthcare. Sell over $20 billion in assets (20 deals already in the works), including transportation, and potentially oil & gas by divesting Baker Hughes (BHGE). Cut costs by over $2 billion in 2018, including $1 billion in GE Power (primarily via 12,000 layoffs). Massive restructuring of management (40% new executives and counting). Cut Board of Directors from 18 to 12 people, removing nine existing members and adding three new industry experts. Realign executive compensation, specifically to focus more on share price and certain key operating metrics like free cash flow. Flannery also promised to greatly simplify the company's complicated accounting, which the company has been accused of using to massage its earnings figures since the days of Jack Welch. This is certainly needed as GE was fined by the SEC in 2009 for "overly aggressive accounting that can distort a company's true financial condition and mislead investors." In addition, GE will be pairing back its ambitious digital internet plans, with future plans for Predix being greatly curtailed to focus on only its fastest-growing and higher-margin product lines. Finally, and perhaps most importantly, GE promises to revamp its corporate culture, admitting that it has become far less nimble and too insular over the years. 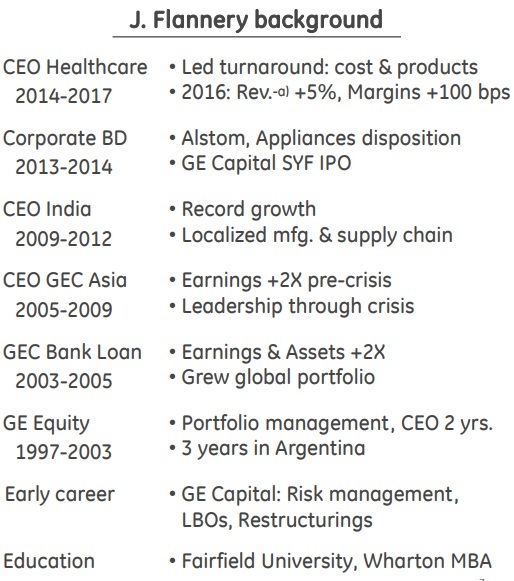 Despite the company's flaws and painful turnaround process, GE's core business units, especially power, healthcare, and aviation, still command large market share positions and benefit from several competitive advantages – economies of scale, long-term customer relationships, and continual investment in R&D. GE’s sheer size provides it with tremendous purchasing power over its suppliers. When combined with the company’s long focus on lean six sigma, GE can underbid most competitors for contracts to supply customers with large equipment. Once GE has secured a deal, it enjoys service contracts lasting 10 to 20 or more years to keep customers’ mission-critical equipment up and running. This is where the real money is made because service contracts typically generate 30%+ margins, keep the customer further locked in with GE, and elevate switching costs. In fact, services generate the bulk of the company's profits today. In addition to cost, GE’s experience in most of its industries spans multiple decades (e.g. GE sold its first jet engine over 70 years ago). Many of its customer relationships are equally long. Importantly, many of the products GE sells are mission-critical pieces of equipment used in mission-critical applications. Utilities can’t afford to have their power generation abilities compromised, airlines can’t afford to have faulty jet engines, and hospitals can’t afford to have a faulty MRI reading, for example. The risk of moving to the latest and greatest technology or competing supplier is too great. In many cases, like in aerospace, the entire project might have to be redesigned to switch to a competitors’ jet engine, requiring high costs and lengthy qualification periods. GE also brings a more comprehensive understanding of a customer’s business when it has worked with and innovated alongside that customer for so many years. Speaking of longevity, R&D has been at the core of GE’s industrial operations for more than a century, and the long-term track record of many of its technologies are likely a key selling point when it comes to bidding on new deals; given the mission-critical nature of GE’s products, customers would prefer to buy from a vendor that can provide decades of equipment performance data. For these reasons, GE has maintained leading market share across many of its divisions, and global competition is often limited to only a handful of major players in most industries. Despite the company's needed turnaround and several advantaged businesses, investors need to realize that GE, even under new management, still has numerous enormous challenges ahead. There are several major challenges with GE's turnaround plans. The first is that, due in part to numerous asset sales over the years, the company's cash flow (what it calls adjusted industrial operating cash flow, or CFOA), has been in decline since 2014, when it peaked at $12.2 billion. In 2017, CFOA hit $7 billion and is expected to decline to $3 billion to $4 billion in 2018. This slump is also due to the cyclical nature of the industrial segments that GE operates in. For example, between 2012 and 2016, collapsing commodity prices around the world hurt many of GE's businesses, including mining equipment, oil & gas, and coal-fired power plants (also hurt by the rise of gas-fired plants and renewable power). However, many of GE's businesses are still experiencing a cyclical downturn. For example, in 2017 the segment profits for transportation, oil & gas, and power fell 23%, 35%, and 45%, respectively. In 2018 management expects only oil & gas to experience a strong rebound, with power and transportation continuing to struggle with shrinking revenue and earnings. In fact, Moody's recently downgraded GE's credit rating citing concerns over the lack of a turnaround at GE power. This brings up another major concern for GE, which is its still highly complex and convoluted accounting, courtesy of earlier remnants of GE Capital. In Q4 2017 GE announced it was taking a $6.2 billion write down (which will ultimately be $7.5 billion) related to the run-off insurance portfolio at North American Life & Health (NALH). NALH is a subsidiary of Genworth Financial (GNW), which the company spun off in a 2004 IPO that raised $3.5 billion for GE. NALH sold numerous financial products, including long-term care insurance, which covered the costs of assisted living and nursing homes. The problem GE now has is that Genworth IPO underwriters Goldman Sachs (GS) and Morgan Stanley (MS) had told it that in order to make the IPO appealing to investors, it had to guarantee the riskiest of these long-term care policies. However, long-term insurance has proven to be a highly challenging industry, because actuaries have badly miscalculated the increasing costs of these products (i.e. mispriced the risk). These costs have been rising significantly for decades due to both longer life spans and steadily increasing retirement home costs (usually about $80,000 to $120,000 per year). GE's most recent results revealed that GE Capital will have to add $15 billion more than expected to its insurance reserve pool to cover Genworth's legacy long-term care insurance policies (the last of which was written in 2006). That includes $3 billion in 2018 and $2 billion per year between 2019 and 2024. In other words, the already-struggling GE Capital, which recently suspended its once enormous dividend to the parent company, will not be able to contribute any earnings or cash flow to GE for "the foreseeable future." Finally, investors need to realize that GE has yet another significant financial challenge, in the form of the largest underfunded pension program in corporate America. Specifically, its pension program, which covers 600,000 current and future beneficiaries, was $31 billion in the hole in 2016 (the last year for which data is available). In 2001 the company's pension actually had a $14.6 billion surplus, which means that in the last 15 years GE has underfunded its pension by nearly $46 billion. And given this trend, it's very possible that GE's pension shortfall is only getting larger over time. Management has announced that it will borrow $6 billion in 2018 in order to cover the next three years worth of pension payment obligations. Despite management's promises that GE will soon become a much more transparent and focused industrial company, the company's complex financial legacy remains opaque and difficult to comprehend. Worse, it's possible that GE's black box of a balance sheet (no one knows what's really in it) will reveal more expensive surprises in the future. However, potentially the biggest question that dividend investors have is in regards to GE's dividend safety and long-term growth potential. After all, $4.2 billion a year in dividends is still a large sum for a company who is struggling to return to growth and whose finances still give it the complexity of a large bank, but without all the profits. Management says that the current dividend is safe and will have a 65% free cash flow payout ratio in 2018. This is due to about $6.5 billion in adjusted free cash flow it plans to generate. But when we look at GE's complex accounting for its free cash flow, the math might not add up as management desires. 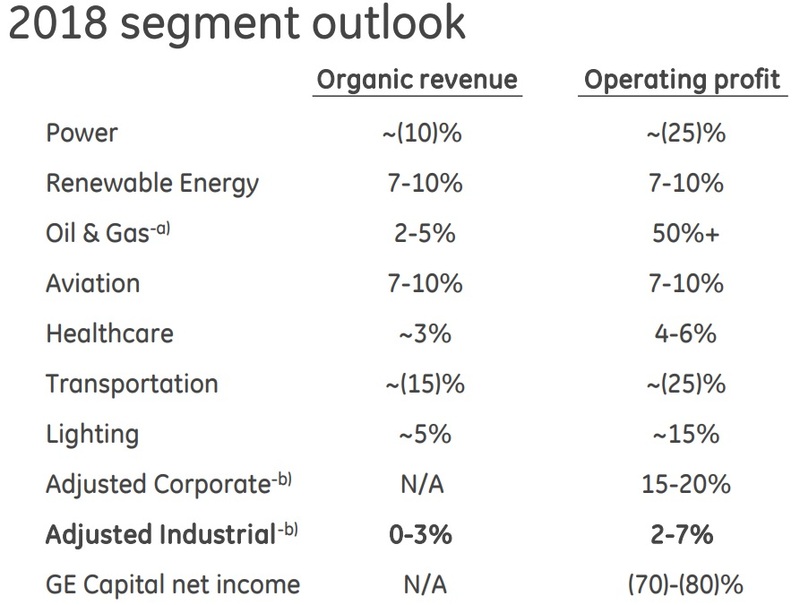 For example, due to large asset sales and the lack of a GE Capital dividend, GE's operating businesses are only expected to generate about $3.5 billion in CFOA next year. In order to achieve management's $6.5 billion adjusted free cash flow, the company is adding back in $6 billion in pension borrowing costs as well as several tax expenses that don't actually represent "non-cash charges". Remember that free cash flow is what ultimately pays the dividend and essentially represents the cash left over after running the business and investing in maintenance and growth investments (capex). 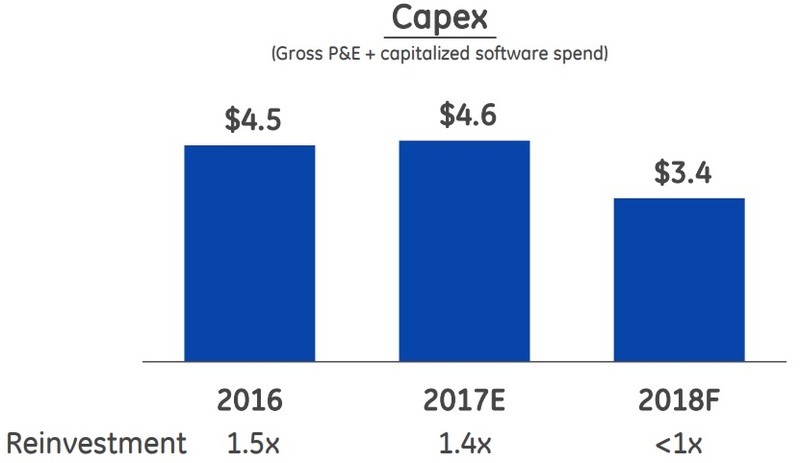 In 2018 GE plans to slash capex by $1.2 billion, to a point where it's not only not growing for the future, but inadequately maintaining its existing assets. One year of under investment doesn't necessarily spell doom for a company. However, if GE is to remain competitive in the future, it will eventually have to ramp up capex again, which will mean that future cash flows could get squeezed if end markets haven't recovered. Or to put it another way, GE's actual 2018 adjusted free cash flow from operations, when excluding the $6 billion in debt that the company will actually have to repay with interest, is about $500 million. And even that positive figure is only due to temporarily cutting investments below maintenance levels (which isn't sustainable in the long term). 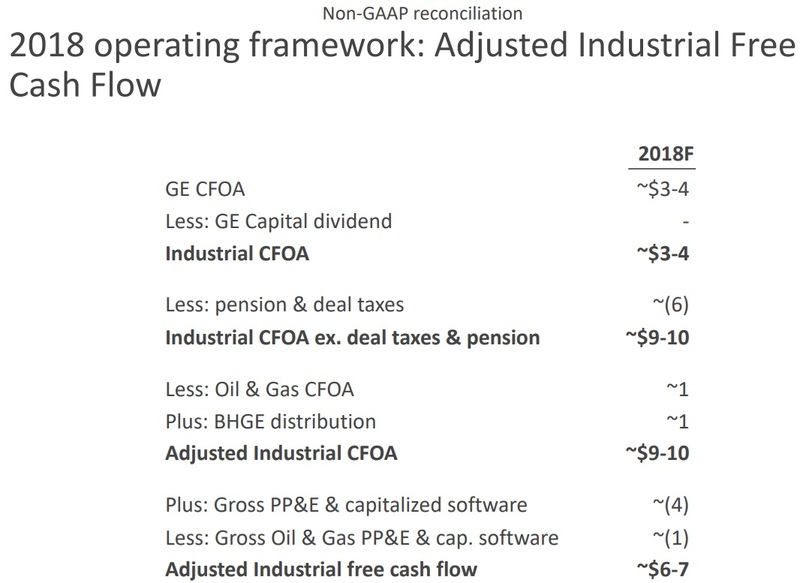 As a result, GE's long-term free cash flow generation capability (when its investing adequately) is likely pretty disappointing. Even the much lower $4.2 billion dividend cost is going to have to be funded out of either debt, asset sales (which further reduce future cash flow generation), or a combination of the two for now. And keep in mind that the industrial sector is cyclical, meaning that sales and earnings rise and fall with the health of the global economy. At some point a future global recession will once more cause industrial earnings to fall, and so GE is racing the clock in terms of turning around its businesses before that happens. The bottom line is that General Electric's dividend, despite the 50% cut, could still prove to be unsustainable. GE investors should not expect the dividend to grow anytime soon. GE's fall from grace has been very disappointing. Decades of mismanagement and questionable acquisitions, asset churning, and poor capital allocation have done a remarkable job at destroying enormous amounts of shareholder value. Unfortunately, GE remains an incredibly hard to run and complex mix of wide moat industrial divisions, burdened by incredibly convoluted and largely unknowable potential future financial liabilities. Add to this the company's enormous unfunded pension problems, and GE seems to be firmly in the "too complex" category. That's especially since, despite its second dividend cut in nine years, GE's current payout continues to represent a potentially unsustainable drain on the company's shrinking resources. Barring a very impressive turnaround and continued strong global economic growth, GE's dividend does not seem like a safe bet given the number of financial uncertainties still facing the company today. Despite the appeal of its profitable and growing aviation and healthcare businesses, GE seems like an income stock to avoid for most conservative investors, especially for risk averse retirees looking to live off dividends.